Middlesbrough lose fifth Sky Bet Championship game in a row at the Riverside Stadium. Adam Webster headed the only goal of the game at the Riverside Stadium as Bristol City won 1-0 at Middlesbrough to climb back into the play-off places in the Sky Bet Championship. Webster struck in the first half on Tuesday night as Lee Johnson's side moved up to fifth, making it impressive back-to-back away wins after seeing off promotion-chasing Sheffield United on Saturday. Boro, meanwhile, remain eighth in the table after a fifth defeat on the spin, and there were calls from dissatisfied home fans for boss Tony Pulis to leave at full-time. Despite their poor run heading into the game, Middlesbrough started in confident fashion at the Riverside - at least until it came to their finishing. On two occasions after 16 and 20 minutes they were presented with sublime opportunities, but George Saville hammered Ryan Shotton's cutback over the bar and then Jonny Howson was denied by Max O'Leary after being fed into the box by Britt Assombalonga. Howson then had an even better chance to score after 26 minutes as he somehow rattled the post from six yards, before Ashley Fletcher's follow-up attempt from point-blank range was cleared off the line. Tony Pulis made two changes to his Middlesbrough side that lost 1-0 to Norwich at the weekend as Stewart Downing and George Saville came into his starting XI. Jamie Paterson returned to the line-up for Bristol City. Bristol City had barely fashioned an attack until that point, but they took the lead on 31 minutes as Webster headed home Jay Dasilva's corner. They should have then doubled their advantage one minute before the break when a swift counter saw the ball worked into Jamie Paterson, but Darren Randolph denied him when he was clean through. Boro continued to push forward in the second half, but their only real opening came after 52 minutes when a well-worked free-kick saw Assombalonga with the opportunity to shoot, but his effort ricocheted off the post and bounced wide. Pulis' team tried their utmost to bomb on for the rest of the game, but it was always comfortable for Bristol City to repel, as they held on for the win. 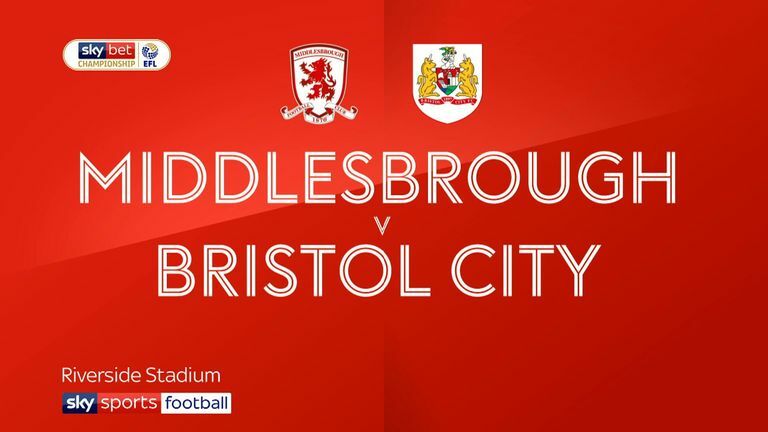 Bristol City were opened up on several occasions in the first half, but their rearguard was superb after the break as they repelled anything Middlesbrough had to throw at them, barely letting them have a shot at goal. Webster was brilliant at the back and it helps he also provided the decisive moment of the game at the other end as well. Both sides are back in Sky Bet Championship action on Saturday at 3pm. Middlesbrough head to Swansea and Bristol City host Wigan.